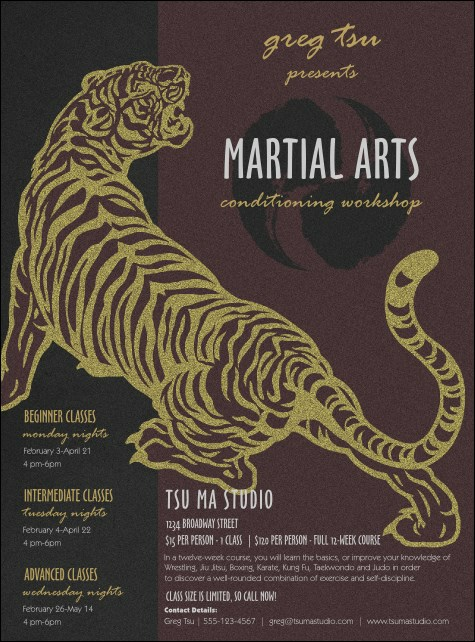 Fight for attention with a Martial Arts Flyer! A large roaring tiger facing the serenity of the Yin Yang symbol dares all to look away. Deep purple and black are accented by glittering gold and white that bring a magnetic atmosphere to your event. Use a whopping 25 open lines to make everyone an authority on the occasion. Make your notices stand out with the right flyer for every function at CanadaTicketPrinting.ca.